Access to the tournament grounds, public seating, and concessions any one day of tournament week (Tuesday - Sunday). 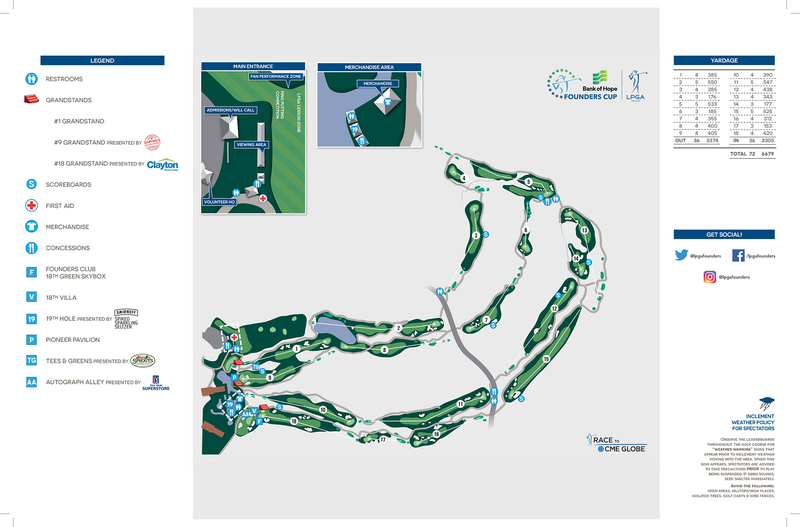 Access to the tournament grounds, public seating, and concessions each day of tournament week (Tuesday - Sunday). **Weekly grounds tickets will be available this fall through our non-profit partners. Access to the upgraded viewing area on the 9th Green, including light lunch and beverages (alcoholic & non-alcoholic). Open Wednesday - Sunday. **Pioneer Pavilion tickets include access to the tournament grounds. Access to elevated viewing area on player right of the 18th green, including food and beverages (alcoholic & non-alcoholic). Open Thursday - Sunday. Quantities are limited. **18th Villa tickets include access to the tournament grounds. Access to premier elevated viewing area located on the 18th green, including food and beverages (alcoholic & non-alcoholic). Open Thursday - Sunday. Quantities are limited. **Founders Club tickets include access to the tournament grounds. You and a guest can walk inside the ropes during a competition round following one of your favorite LPGA players! You must be of good health and able to walk the course. Available online only. Player requests are fulfilled on a first-come, first-serve basis. Space is limited.